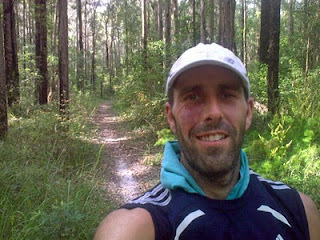 Ultra Marathon Running: 4 Seasons of Running in 2 hours! Today’s run had it all. I had arranged to run with my training partner Tylana at 4pm, but had the chance to get out earlier, so took the opportunity to get out for a bit of a warm up, and boy was it warm. It was 34C when I left the house, and the real killer was the 90% humidity. I have found humidity is far more limiting for me than the heat as it impedes the efficacy of sweating in cooling your body. This is part of my running blueprint that I have learnt from logging my training sessions. It was a good thing that I had learnt from previous runs to be prepared for what was ahead of me. I had a full 3l bladder of water and 1 bottle of Endura, and I was going to need it as the sweat was dripping from my nose within the first 500m. I was really happy that I did take the opportunity to get out there a bit earlier, as I have had little time to get out and run recently (and to be honest lacking in motivation to get up at 5am to run, but that is changing). 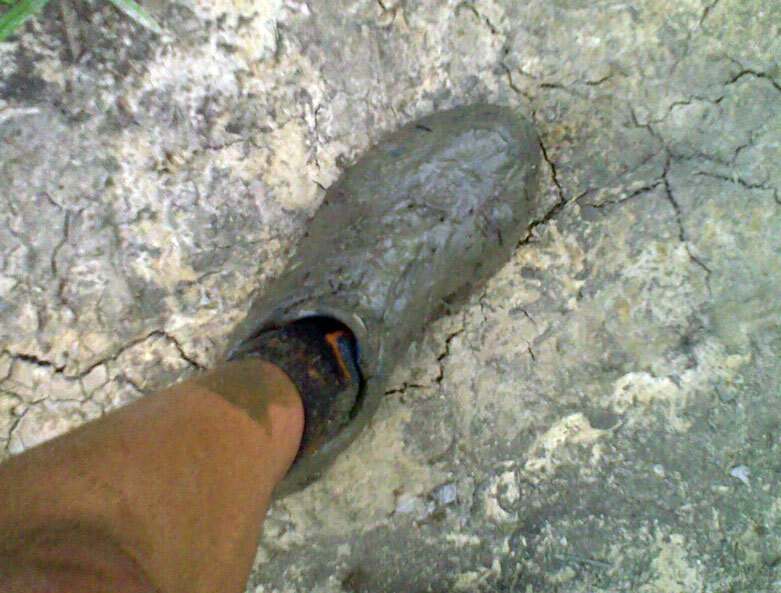 I had fun running through the dried mud tracks only to find a nice dry crust over the sort of mud pigs and kids go wild for, and this was the end result. About 1kg of extra weight on one leg made for an interesting workout. 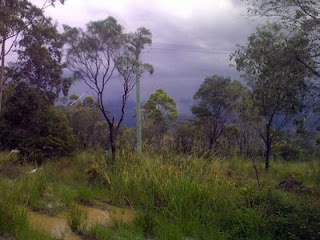 After an hour I met up with Tylana, and it was still very hot and humid, but there was a storm brewing. I checked the weather website and within a 10 minutes the wind picked up by 20kmh and the temperature dropped by 5 degrees. This was very welcome relief, but there was a bit more than we bargained for. Half an hour later it enveloped us! The rain was steady and not too heavy and then it got dark, and the thunder was getting closer and louder. Being quite a bit taller I knew I was the one the lightening Gods were going to take out first! So we decided to take the quick route back home – good choice. About 800m from our finish it got darker again and the area resembled a scene out of “Twister”. The rain started lashing down, and the wind was intense (but at least it was at our backs and pushed us along). Branches were being ripped from trees, one was uprooted, cars had pulled over because of the intensity of the rain and the roads had become rivers – all this in a matter of seconds. It eased for about a minute, although still raining heavily, and then with only 300m to go it gave us another heavier full on dose, with more of the same. I checked afterward and the wind was blowing at over 80kmh and we had 15mm of rain in these few minutes. I didn’t get a picture during this storm as it was just too wet, but think of the pictures of the hurricanes and cyclones you see on tv and that was pretty much it. It was really exhilarating and something I look forward to doing again, although I’m not sure about the falling branches and lightening. It got me thinking about all those people who don’t get out and enjoy what nature has to offer. Even at its most harsh, it was a great experience and awe inspiring. So what is the lesson? Don’t ever use the weather as an excuse to stay indoors. I’m reading about all you guys running the snowy trails in the US and Europe, and am very jealous. It reminds me of my cross country running at school along the narrow country roads with snowdrifts on either side, slushy puddles filling your shoes and the red glow of your skin from the cold. Of course it was not cool at school to suggest you enjoyed it then, but 25 years on things have changed. Rain, wind or shine get out there and enjoy it! I love running in the rain. But I'm not a big fan of lightning. There is a balance between getting out there and keeping yourself safe. Running in the woods with lightning striking is where I draw the line. Otherwise, I love running in the rain! Love it, love it, love it! I DOOOOOOOOOOOO love running in the rain. THE BEST!! Glad you like to posts. Running in the heat and rain is good, but it's nice to have different conditions to run in to test your mind and body in other ways. Although from what I have seen on News reports in the Northern Hemisphere, perhaps that's a little to extreme. 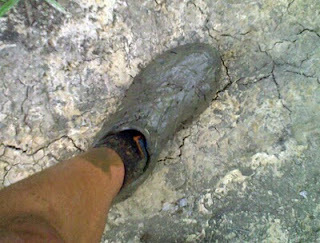 Wow, that is a lot of mud! I agree 100%, the weather is no reason for excuses, but safety first. Humidity and heat is my worst enemy.